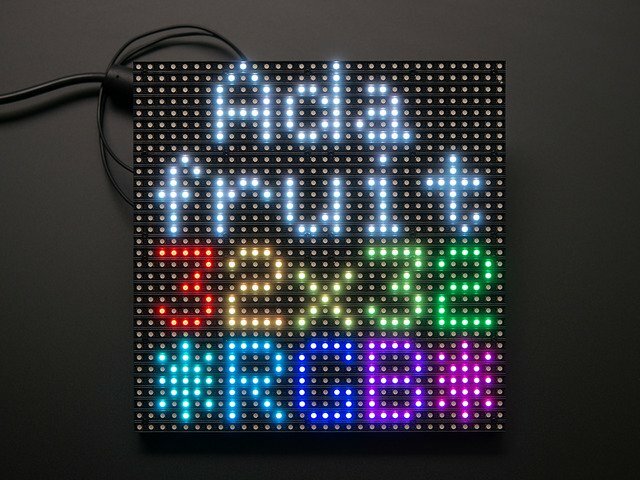 This guide is for ARDUINO and compatible boards — Arduino Uno, Mega, Zero, and Adafruit Metro 328, Metro M0 and M4. We have a different guide for Raspberry Pi. 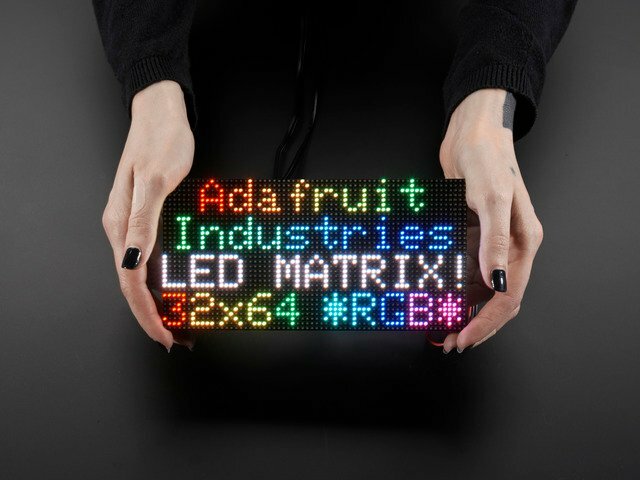 Bring a little bit of Times Square into your home with our RGB LED matrix panels. These panels are normally used to make video walls — here in New York we see them on the sides of buses and on bus stops — to display animations or short video clips. We thought they looked really cool so we picked up a few boxes from the factory. 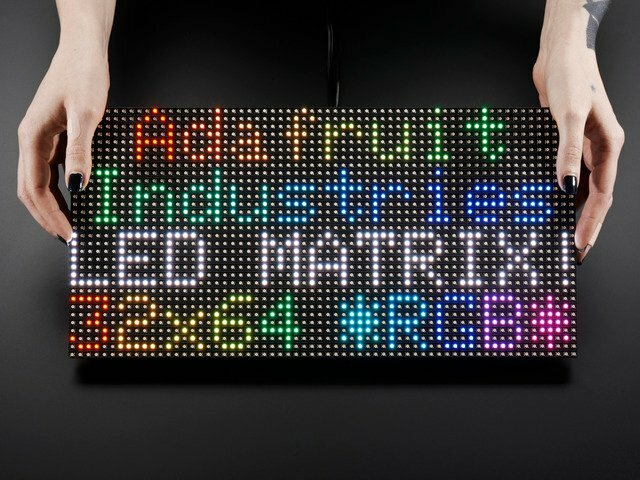 One has 512 bright RGB LEDs arranged in a 16x32 grid on the front, the other has 1024 LEDs in a 32x32 grid. 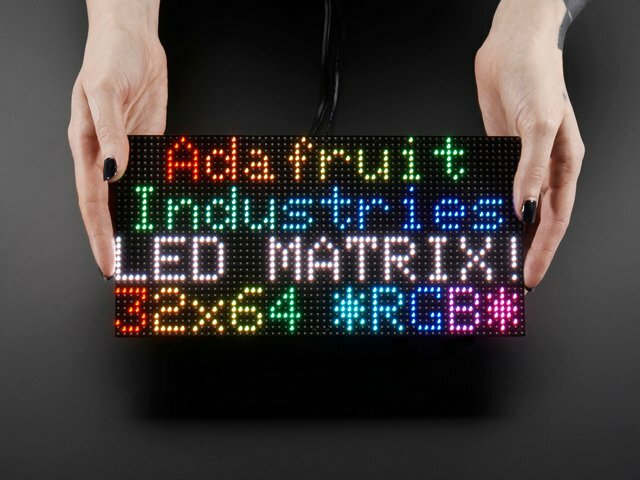 On the back is a PCB with IDC connectors (one set for input, one for output: in theory you can chain these together) and 12 16-bit latches that allow you to drive the display with a 1:8 (16x32) or 1:16 (32x32) scan rate. These panels require 12 or 13 digital pins (6 bit data, 6 or 7 bit control) and a good 5V power supply, at least a couple amps per panel. We suggest our 2A (or larger) regulated 5V adapters and either a terminal block DC jack, or solder a jack from our DC extension cord. Please read the rest of our tutorial for more details! 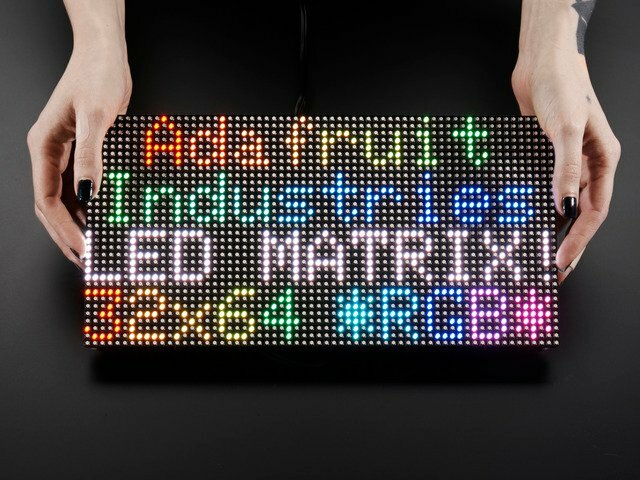 Keep in mind that these displays are normally designed to be driven by FPGAs or other high speed processors; they do not have built in PWM control of any kind. Instead, you're supposed to redraw the screen over and over to 'manually' PWM the whole thing. 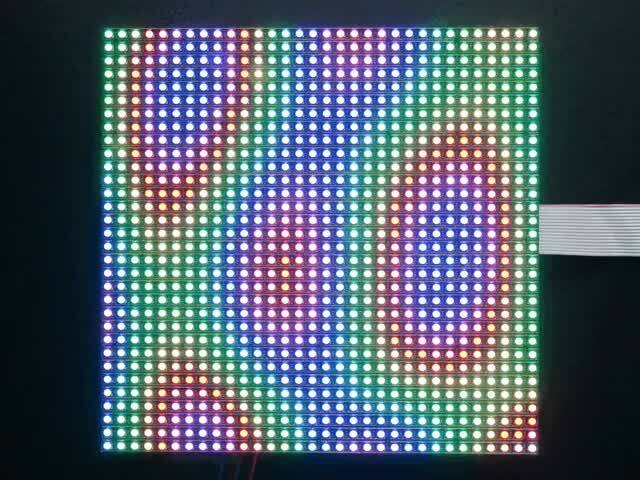 On a 16 MHz Arduino Uno, we managed to squeeze 12-bit color (4096 colors) but this display would really shine if driven by an FPGA, CPLD, Propeller, XMOS or other high speed multi-processor controller. Of course, we wouldn't leave you with a datasheet and a "good luck!" 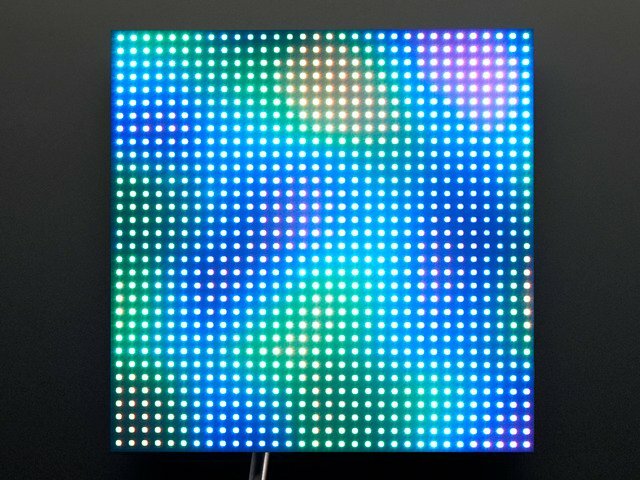 We have a full wiring diagrams and working Arduino library code with examples from drawing pixels, lines, rectangles, circles and text. You'll get your color blasting within the hour! 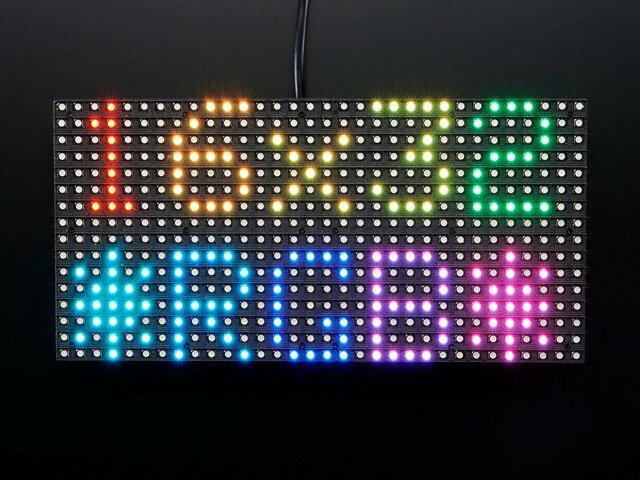 On an Arduino Uno or Mega, you'll need 12 digital pins, and about 800 bytes of RAM to hold the 12-bit color image (double that for the 32x32 matrix). The library works with a LIMITED NUMBER of boards: Arduino Uno, Mega, Zero, Adafruit Metro M0 and Metro M4. Other boards (such as the Arduino Leonardo) ARE NOT SUPPORTED. This guide was first published on Dec 11, 2012. It was last updated on Dec 11, 2012. This page (Overview) was last updated on Apr 18, 2019.